Click on image to link to store. What sort of king was Jesus? What is the meaning of Jesus’ description of himself in Matthew’s Gospel as the meek king? 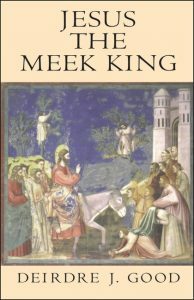 Jesus the Meek King is an exploration of a specific virtue in Paul, Matthew, the Hellenistic world, and English literature from Tyndale to the present. Modern readers are likely to understand the meek as Jesus’ attempt to commend and exemplify submissive or humble behavior. The meek may even be seen unfavorably as those likely to submit tamely to oppression or injury. Ancient readers of Greek texts, however, understood the term more broadly as a trait of rulers whereby exercise of disciplined compassion overcomes anger. Meekness is also a dispositional virtue in the literature of the first century describing new Jewish and Christian groups and enhancing community life. Most recent books about Jesus focus on history and biography. This book eschews historical questions for culturally specific understandings of humility and meekness. The result is a full and contextual understanding of Jesus the meek king. Deirdre J. Good is Professor of New Testament at General Theological Seminary, New York.